When seriously injured in an accident, you might be confused on what you can do for help. 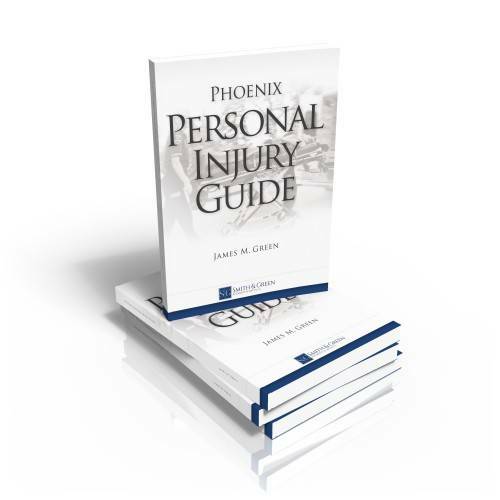 The Phoenix Personal Injury Guide was created by attorney James Green to help Arizona residents who have been hurt by the negligence of another. Have you been seriously injured due to someone else’s negligence? There are many causes of injury that a Phoenix personal injury attorney can represent you for. An accident such as these can change your life forever and leave you completely devastated. You need to focus on healing and getting better, but the insurance companies might be knocking at your door trying to get statements from you in vulnerable states of mind. A Phoenix personal injury attorney can take up the burden of dealing with this case and help you get proper compensation. Phoenix car accidents can turn your world upside down, and have the potential to cause serious, life-changing injuries including traumatic brain injuries, broken bones, paralysis, internal injuries, and even fatalities. Even if there are no serious injuries, there can still be steep medical bills and property damage that must be covered. You could be sued, or a lien could be placed on your property if you are unable to pay those medical expenses that you incurred because of someone else’s negligence and not being able to go to work. Using public transportation in Phoenix is the norm for hundreds of thousands of residents. What happens if you’re hurt in an accident involving a bus? Should you sue the driver or take on the city by yourself? If you have questions about how you should handle a potential bus accident claim, call a Phoenix bus accident lawyer to schedule a case review. Many of our clients have advised us that immediately after an accident, they have been contacted by their insurance company asking for statements. There have been situations where, after an accident, you think that you should immediately contact your insurance company. You really shouldn’t do that. I recommend that you contact your attorney and let us call your insurance company for you. The reason I say that is there are certain things that you could say that could hurt your case. Now, most people think that their own insurance company is on their side. The sad reality is that the insurance companies may be trying to limit their exposure so that they can pay you as little as possible. Make sure you contact your attorney. Let your attorney handle the conversations with the insurance companies so that you don’t say anything that could mess up your case. What First Steps Should I Take After an Auto Accident? For our clients that have been injured in motor vehicle accidents, our biggest concern, and it’s always going to be our biggest concern, is their health and wellbeing. That’s the number one priority. If you’re injured in a motor vehicle accident, the first thing that you want to do is make sure that you seek out proper medical treatment. Go to the hospital. Go to all of your appointments. If they recommend going to a chiropractor, go to the chiropractor. If they recommend physical therapy, go see a physical therapist. Our concern should not be with how long it is going to take to recover money for you or how long it’s going to take for us to get paid. That’s not our biggest issue. Our biggest concern is your health. We will ultimately recover for you, but we want to make sure that you take care of yourself first. What if I’m Hit by a Driver Who Doesn’t Have Enough Insurance? Is it Bad if I Don’t Seek Immediate Medical Care? My advice is if you are in a motor vehicle accident, as soon as you see any sign of injury whatsoever, back pain, neck pain, leg pain, you should immediately seek out medical care. It certainly makes it easier for us to recover for those injuries if we can show that the injury is related to the accident. Now, if you’re in that situation where you didn’t seek out care and it did take some time for the injury to manifest, that does not bar your claim. Again, we would rather you have sought treatment right away, but if you did not, that’s not unusual. That happens from time to time. If that happened to you, seek out counsel from an experienced injury attorney in Arizona. That is a very difficult question to answer. A lot of times it comes down to the specific nature of that person’s injuries. Not only the physical injuries but sometimes there can be some mental injuries as well. It can be very difficult assessing or valuing a case. We can look at precedent. We can look at other cases that have been settled in the state of Arizona. There are other things that we can do to help you determine the value of your case. There’s no set formula for determining the appropriate value of a case. It can be difficult. You need an experienced attorney in Arizona to help you determine what the value of your case is. Arizona has one of the stricter laws regarding drinking and driving in the nation. Unfortunately, that doesn’t detour everyone from engaging in that type of conduct. There are accidents caused in this state every day involving drivers who are intoxicated. In most cases, nearly all cases, the fact that the person was intoxicated is proof that the person was negligent. Therefore, it makes it a little bit easier for us to recover from that person or from that person’s insurance if they are responsible for that accident. It’s essentially proof that they were negligent. It makes it a lot easier. If you’re involved in a motor vehicle accident involving somebody that was intoxicated, please contact us so that we can help you. What Questions Should I Ask a Dog Owner? The first thing that I would want to know if I was representing somebody that was bit by a dog was, if you asked the owner questions about the dog. Has the dog ever shown a propensity for violence in the past? Has that dog ever bit anyone else? Does the dog have all of its shots? Does it have its rabies shots? You want to make sure of those things. Is the School Liable for Injury? Can I Go After a Store if I Slip and Fall? You shouldn’t be responsible for the medical bills because of somebody else’s negligence. If you ever slip and fall and you’re injured, first off, seek medical care for your injuries. Then also contact your attorney so that they can help you recover for those injuries. This entry was posted in Arizona Legal Guides, Bicycle Accidents, Bus Accidents, Car Accidents, Dog Bites, Motorcycle Accidents, Pedestrian Accidents, Phoenix Injury Blog, Phoenix Law Blog, Slip & Falls, Truck Accidents. Bookmark the permalink.